When you finish giving your presentation to investors, you often have your last slide sitting on the screen behind you. Make this slide do more than just convey standard contact information. To make the best use of this screen, create a summary slide highlighting all the things that make your company exciting. Break the slide into four or six divisions and fill each with reminders of your strong points (see the figure). Highlight the important points you want the audience to walk away with. Don’t worry about repeating yourself here. Your goal is to remind the audience of all the great reasons they should invest in your company. Each company has different strengths. 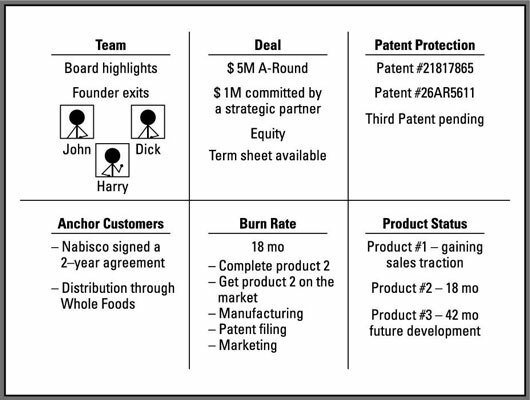 Think about why your company stands out and add those points to the summary slide. Always include the team and terms of the deal. Options for other highlights include distribution partners, intellectual property, exit strategy, current revenues, current growth rate, recently overcome risks, use of funds, and size of the addressable market. After your live pitch, you’ll have a question and answer period. You can impress your audience by having a few slides to pull out of your back pocket when relevant questions are asked. Think about what investors are likely to ask and add four or five slides after your summary slide. If nobody asks questions relevant to these slides, then nobody will know they are even there. However, if you get questions that reference these slides, having these slides at the ready shows that you anticipated the investors’ questions and prepared thoughtful responses to them. Investors want to believe that you have thought things through carefully, and this is your time to show them that your thinking goes much deeper than the high-level information you have provided in your pitch. Make sure your audience has your contact information. Pass out cards if the group is small enough. Put your e-mail address and website on your first and last slides. You want to make it easy as pie for the venture capitalists to get in touch when they have a question.